Our food forest has many mice, voles and other small animals who find food and homes in the hugelkulture mounds, woodchip mulch and straw bales. In summer, we see many critters running across the trails, brief glimpses of mice and rodents. We’ve also seen an increase in predators, large snakes sunning themselves, hawks flying overhead and even larger predators like coyotes wandering by in hopes of a rabbit or squirrel. So, when I was able to acquire a trail cam, I was hoping to get some of these guys on film and it worked! 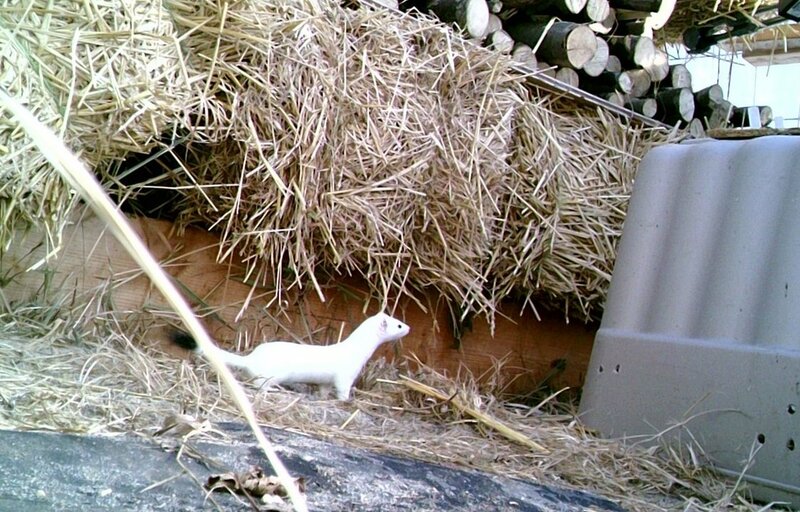 We were rewarded with some clear shots of our very own Stoat (a short tailed weasel) keeping our greenhouse mouse population in check. Based on multiple shots, it looks like we have a family of stoats with some smaller ones in the mix. Stoats feed on mice so hopefully this reduces some of the mice that have been ringing our apple trees. Our local food forest has plenty of urban visitors but we’ve also had surprises. This hawk landed on the Heartnut tree right outside our front window and was inspecting the local bird feeder for lunch options. Based on the snow face, I think this fellow had just missed his last mark and got a face wash instead. After the last set of pictures from the greenhouse cam, we set it up in a higher angle in hopes of some more cool shots which we will post here. Food foresters, wild food, wild life.